BACKGROUND Clonal T cell receptor (TCR) gene rearrangements and loss of T cell antigens such as CD8 and TCR-β in intraepithelial lymphocytes (IELs) may indicate the development of an enteropathy-type intestinal T cell lymphoma (EITCL) in patients with refractory sprue. AIMS To define the diagnostic value of these markers in duodenal biopsies from patients with villous atrophy as a result of various underlying disorders. PATIENTS AND METHODS Duodenal biopsies from eight patients with coeliac disease and five patients with villous atrophy caused by defined disorders were compared with three patients with refractory sprue evolving into overt EITCL, two patients with ulcerative jejunitis, and with eight patients with overt EITCL, for expression of CD3, CD4, CD8, and TCR-β in IELs using immunohistochemistry and for clonal TCR-γ gene rearrangements using polymerase chain reaction. In addition, biopsies from six consecutive patients with refractory sprue of uncertain cause were examined. RESULTS Clonal TCR-γ gene rearrangements were found in all resected tumours of patients with EITCL, in 3/8 duodenal biopsies of patients with EITCL, in 2/2 patients with ulcerative jejunitis, in 2/3 patients with refractory sprue evolving into overt EITCL, and in 1/6 patients with refractory sprue. No rearrangements were found in biopsies from patients with refractory sprue caused by defined disorders or those with coeliac disease. Clonality in duodenal biopsies was associated with an abnormal phenotype of IELs in all cases and in all but one case in patients with evidence of underlying coeliac disease. Specificity for detection of an EITCL using immunohistology was 77% for CD8 and for TCR-β staining, and 100% for detection of a clonal TCR-γ gene rearrangement. Sensitivity was 62% for staining with CD8 and clonality investigation, while sensitivity reached 100% for TCR-β staining in all investigated patients with EITCL. CONCLUSIONS Clonal proliferations of phenotypically abnormal IELs in refractory sprue represent an early manifestation of EITCL, for which the term “sprue-like intestinal T cell lymphoma” is proposed. This constellation is also found in duodenal biopsies from patients with an overt EITCL and is not related to other sprue syndromes, resulting in a high specificity for detection of an EITCL or refractory sprue evolving into EITCL. Overt EITCL may develop directly from coeliac disease without a precursor lesion (refractory sprue with clonal IELs) being demonstrable in duodenal biopsies or via a “sprue-like intestinal T cell lymphoma”. This latter entity is a complication of coeliac disease. Enteropathy-type intestinal T cell lymphoma (EITCL) is a complication of longstanding and untreated coeliac disease.1-3 It is associated with a poor prognosis due to its late diagnosis and high rate of complications. Earlier diagnosis and consecutive treatment have been suggested to improve survival because of lower clinical stages at diagnosis.4 The epitheliotropism and immunophenotypic properties—for example, expression of CD103—of EITCL indicate a derivation from intraepithelial T lymphocytes (IELs). Furthermore, histological features of EITCL include an increase in IELs, villous atrophy, and crypt hyperplasia in areas adjacent to and/or distant from the main tumour site.3 5 6 In the absence of overt tumour infiltration, these findings are histologically indistinguishable from other diseases with crypt hyperplasia and villous atrophy,3 7-9 thus rendering the differential diagnosis of EITCL from refractory sprue syndromes in duodenal biopsies a clinical and histopathological challenge. In this study, we analysed duodenal biopsies from patients with different forms of refractory sprue, EITCL, and coeliac disease for T cell antigen expression and clonality in IELs for several reasons. Firstly, there are no data on patients with refractory sprue due to defined disorders and therefore their relationship to refractory sprue with clonal IELs is not clear. Furthermore, the precise frequency of clonality and antigenic loss in refractory sprue has not been described. In addition, data on the characteristics of intestinal IELs of patients with EITCL are sparse and contradictory: Spenceret al found no differences in T cell antigens in three patients compared with patients with coeliac disease7 while Bagdi et alreported uniform clonality and antigenic loss (CD8 negativity).16 These findings have decisive implications both for our understanding of the pathogenesis of EITCL and for diagnostic purposes. We focused our study on duodenal biopsies as these are undertaken in many centres for the initial workup of disorders associated with malabsorption. In 7/9 patients with an EITCL, coeliac disease had been diagnosed previously. Median time between diagnosis of coeliac disease and diagnosis of EITCL was 42 months (9 months to 24 years). In one patient, coeliac disease was diagnosed simultaneously with EITCL by detection of antiendomysium antibodies (EITCL4). One patient was excluded due to microscopic infiltration of the duodenum by tumour cells (EITCL8). The primary tumour location in all cases was the small bowel (table 1). Two patients presented with a clinical and endoscopic picture of ulcerative jejunitis (Ashton-Key). Both presented with clinical signs of coeliac disease but sprue typical antibodies were found in only one patient. Response to a gluten free diet lasted 12 and 33 months, respectively. Whole bowel wall resection was performed for final diagnosis in both cases (table 1). Refractory sprue of uncertain cause was defined by the following criteria: (1) villous atrophy refractory to a strict gluten free diet; (2) negativity for antiendomysium IgA or antigliadin IgA antibodies while on a gluten free diet; (3) exclusion of hypergastrinaemia, infectious causes, allergic reactions, Crohn's disease, bacterial overgrowth, collagenous, or tropical sprue; and (4) no evidence of intestinal lymphoma after thorough investigation including computed tomography scans, small bowel x ray, and endoscopic investigation. Only one patient had an earlier diagnosis of coeliac disease but his response to a gluten free diet lasted for 10 months only (RS6). Two patients died from disease related causes without evidence of intestinal lymphoma at autopsy (table 1). In two patients, thickening of the subepithelial matrix established the diagnosis of collagenous sprue.11 Three patients had villous atrophy due to a sprue-like syndrome associated with ulcerative colitis, common variable immunodeficiency, and autoimmune enteropathy, respectively. A more detailed description of the case with autoimmune enteropathy is published elsewhere.23 None of the patients had coeliac disease (table 1). Patients with coeliac disease on a gluten containing diet served as a control group. Inclusion criteria were: availability of the initial duodenal biopsy under a normal diet, prompt clinical response to a gluten free diet, and positivity for antigliadin or antiendomysium antibodies. Duodenal biopsies under a gluten free diet were available in 6/8 patients showing histological improvement (table1). DNA was extracted from formalin fixed, paraffin embedded, duodenal and colonic biopsies and resected tumour according to the manufacturer's instructions (QIAamp tissue kit; Qiagen GmbH, Hilden, Germany). DNA was stored at 4°C for a maximum of four weeks until further usage. Oligonucleotide consensus primers for detection of Vγ1 to Vγ8 segments were used in a semi nested polymerase chain reaction (PCR) in conjunction with established Jγ primers, as described by Dippel and colleagues.24 Primers were synthesised on an automated DNA synthesiser (Model 381A; Applied Biosystems, Weiterstadt, Germany) and purified by high pressure liquid chromatography. A semi nested PCR was performed for detection of clonal TCR-γ rearrangements. In the first round of amplification, two separate reactions were carried out employing the same Vγ1–8 consensus primer in conjunction with the Jγ primer JGT1/2 and JGT3, respectively. An aliquot (1%) of the first two PCRs was used for reamplification which was performed with a nested Vγ1–8 primer and the same Jγ primers (table 1). DNA (200 ng) extracted from paraffin embedded tissue sections was used in the first PCR. The reaction (100 μl) was carried out after a hot start technique (AmpliWax PCR GEM 100; Perkin Elmer, Weiterstadt, Germany) with 2.0 mmol/l MgCl2, 800 μmol/l deoxyribonucleotides, 1.25 U of Taq polymerase (Ampli Taq DNA Polymerase; Perkin Elmer), 10 μl of 10× PCR buffer (Perkin Elmer), and 200 ng of each primer. For reamplification, 1 μl of the first amplification product was used as a DNA template. Buffer conditions were identical with the exception of 1.5 mmol/l MgCl2. Cycling parameters were 96°C (15 seconds) for denaturation, 60°C (40 seconds) for primer annealing, and 72°C for strand elongation for 30 seconds each (25 cycles). For denaturation, 96°C was extended in the first step to four minutes. PCR products were visualised on ethidium bromide stained 6% polyacrylamide gels. For negative controls water samples and for positive controls DNA from a T cell lymhoma cell line (PEER) were run in parallel with each PCR. Contamination was strictly avoided by separating DNA isolation, PCR set up, and processing into different rooms, using gloves at all times. For GeneScan analysis, reamplification was performed under the same conditions as described above employing fluorescence labelled Vγ1–8 primers. Deionised formamide (2.0 μl), 0.5 μl of loading buffer, and 0.5 μl of 6-carboxyrhodamine dye labelled DNA size standard buffer mixture (Genescan-500-ROX; Applied Biosystems, Weiterstadt, Germany) were mixed with 1 μl of PCR product and heated for three minutes to 90°C. The samples were immediately chilled and 5.0 μl loaded onto a 6% acrylamide gel containing 6 mmol/l urea and analysed in an automated DNA sequencer 373A. Size determination was performed on a Macintosh computer with the GeneScan software 672 (Applied Biosystems).24 Clonality was defined as the occurrence of one or two dominant bands. Biclonal or monoclonal PCR products were cut out from the polyacrylamide gels and incubated overnight in 20–30 μl of distilled water. The supernatant (5 μl) was used for direct sequencing (BigDye; Perkin Elmer) employing the reamplification primers in two separate sequencing reactions. The reaction mixtures were analysed on a 377A automated DNA sequencer (Applied Biosystems) according to the manufacturer's instructions. Endoscopically removed or resected material was fixed in 10% formalin. Villous atrophy was graded according to Marsh and colleagues25: grade I, infiltrative lesion; grade II, infiltrative-hyperplastic lesion; grade III, flat-destructive lesion with subtotal villous atrophy; and grade IV, flat-destructive lesion with total villous atrophy. Sections of formalin fixed paraffin embedded tissue were used for immunohistochemistry applying the immunoalkaline phosphatase method with the following antibodies: βF1 (TCR β chain) from T cell Sciences (Cambridge, USA), 123C3 (CD56) from Monosan (Uden, Netherlands), and 1F6 (CD4), C8-144 (CD8), and CD3 (polyclonal) from Dako (Glostrup, Denmark). Pretreatment was done using high pressure cooking for antigen retrieval in a 10 mmol/l citrate buffer, pH 6.0. Pretreatment for βF1 consisted of proteolytic digestion. IELs and positively stained IELs were counted per 750 epithelial cells under blinded conditions. Results are expressed as (positively stained) IELs per 100 epithelial cells and per cent of positively stained IELs. Results were compared using the Mann-Whitney U test and the Kruskal-Wallis test for unpaired samples. Results of patients with refractory sprue due to defined disorders were not evaluated in this test because of different disease entities. For evaluation of TCR-γ gene rearrangement, the χ2 test was used. Specificity was defined as the frequency of a negative test (clonal rearrangement of the TCR-γ gene and/or loss of T cell antigens) in patients without EITCL (coeliac disease and refractory sprue due to defined disorders) and sensitivity as the frequency of a positive test in patients with EITCL (primary overt EITCL, ulcerative jejunitis, and refractory sprue evolving into overt EITCL). IELs were increased in all patients with EITCL above 40 per 100 epithelial cells. In patient EITCL8, overt infiltration of the duodenum by the lymphoma was found on histology and immunohistology. Data from this patient were therefore excluded from the statistical analysis. All patients had grade III–IV enteropathy except for patient EITCL2 who had grade II enteropathy with a patchy increase in CD56 positive IELs (table 1). Multiple ulcerations without evidence of lymphomatous infiltration were observed in the duodenum of patients with ulcerative jejunitis. In the first patient with collagenous sprue (CoS1), a 35 μm thick subepithelial band-like structure, positive for van Gieson's staining, was seen. In the other patient with collagenous sprue (CoS2), subepithelial collagen deposition reached a thickness of 50 μm. In the patient with common variable immunodeficiency, weakly periodic acid-Schiff positive macrophages and a reduced number of plasma cells were found. A non-specific lymphocytic infiltrate was seen in the patient with ulcerative colitis associated sprue syndrome. Finally, the patient with autoimmune enteropathy presented with signs of chronic inflammation in the lamina propria, vacuolisation of the surface epithelium, but no significant increase in IELs. Patients with coeliac disease showed a dense mononuclear infiltrate in the lamina propria. Median IEL counts in coeliac disease were higher in comparison with the other groups but this difference was not statistically significant (table 1, fig 1A). Absolute numbers of intraepithelial T lymphocytes (IELs) (A), and positively marked IELs with anti-CD3 (B), CD8 (C) and T cell receptor (TCR)-β (E) per 100 epithelial cells are shown. In addition, the percentage of positively marked IELs with anti-CD8 (D) and anti-TCR-β (F) of the total IELs was calculated. Clonal rearrangements of the TCR-γ gene are depicted by filled symbols. The number of CD 8 and TCR-β positive IELs in duodenal biopsies of patients with enteropathy-type intestinal T cell lymphomas (EITCLs) were significantly reduced in comparison with patients with coeliac disease (C–F). In most cases, clonality was associated with reduced expression of T cell antigens. RSUC, refractory sprue of uncertain cause; RSDD, refractory sprue due to defined disorders. For other abbreviations see table 1. CD3 staining of the duodenal biopsies confirmed the histological data, except in two cases in which lower numbers of CD3 positive IELs were counted (EITCL1 and EITCL2; fig 1B). 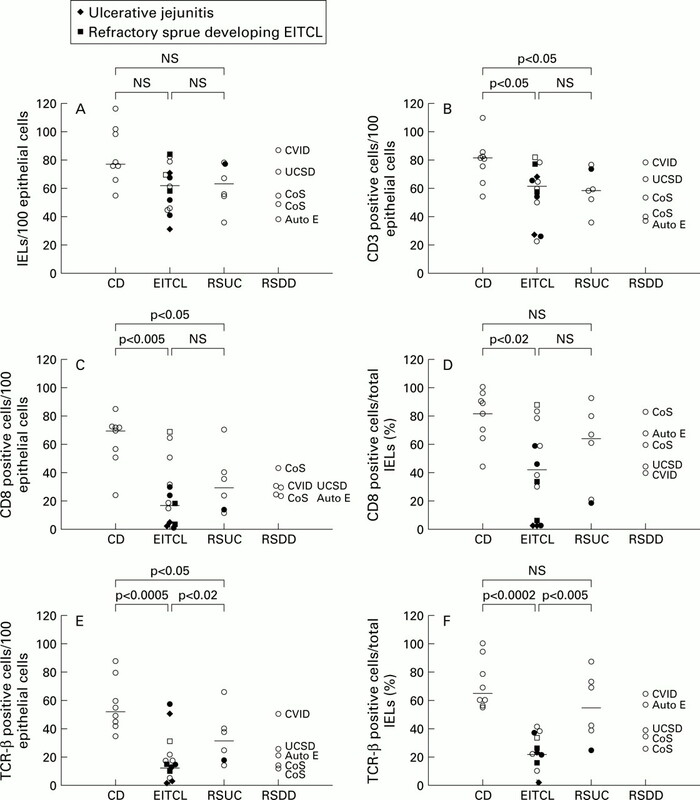 In patient EITCL2, IELs and tumour cells were CD56 positive. Duodenal biopsies from patients with coeliac disease showed significantly more CD3 positive IELs compared with patients in the EITCL group, and compared with patients with refractory sprue of uncertain cause (fig 1B, fig 2). The numbers of CD3 positive IELs in patients with sprue syndromes due to defined disorders were similar to those of the EITCL group (fig 1B). As the absolute numbers of IELs were very variable, we used the proportion of CD8 or TCR-β positive IELs as a more reliable factor. The proportions of CD8 and TCR-β positive IELs were significantly decreased in patients in the EITCL group and in those with refractory sprue of uncertain cause in comparison with patients with coeliac disease. The proportion of TCR-β positive IELs in patients in the EITCL group was decreased compared with refractory sprue patients of uncertain cause (fig 1F, fig2). One patient with coeliac disease had low numbers (<50%) of CD8 positive IELs but responded to a gluten free diet. Histological examination indicated an improvement after a gluten free diet. This patient is clinically well five years after the initial diagnosis. In three patients with EITCL, TCR-β staining could not be evaluated because the initial staining failed and further tissue was not available. CD4 was expressed only in a small proportion of IELs in all groups of patients (medians (minimum-maximum): EITCL 3 (0–9); refractory sprue of uncertain cause 6 (4–9); refractory sprue due to defined disorders 3 (1–17); and coeliac disease 3 (1–23); p=0.22). 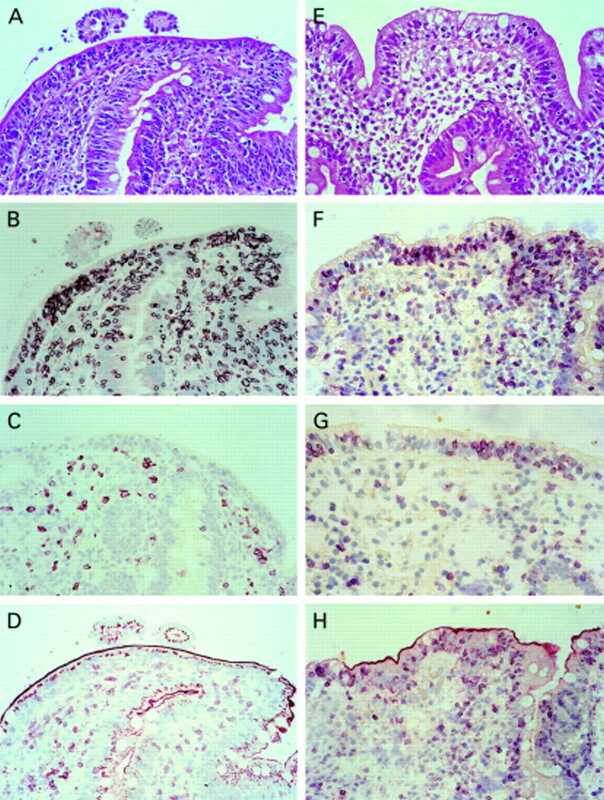 Haematoxylin-eosin staining (A) and immunohistochemistry (B–D) of a duodenal biopsy of a patient with an enteropathy-type intestinal T cell lymphoma (EITCL) showing an increased number of intraepithelial T lymphocytes (IELs) in conventional histology (A) that were mostly positive for CD3 (B) but negative for CD8 (C) and T cell receptor (TCR)-β (D), and a patient with coeliac disease (haematoxylin-eosin (E); CD3 (F); CD8 (G); TCR-β (H)). IELs in the duodenal biopsy of the patient with coeliac disease were CD3, CD8, and TCR-β positive (F–H). Original magnification 100×. Patients with collagenous sprue had CD3 positive IELs exceeding 40 per 100 epithelial cells. The proportion of CD8 positive IELs was above 50% but TCR-β was only detected in a small percentage of IELs (see fig 1D, F) in both. Lymphoma tissue of patients with overt EITCL and refractory sprue evolving into EITCL was negative for CD8 in 8/12 cases and negative for the TCR-β in 9/10 cases (in two cases staining for TCR-β was not possible). There was no correlation between the phenotype of the tumour cells and the phenotype of IELs in duodenal biopsies (data not shown). Investigation of TCR-γ gene rearrangement for clonality in duodenal biopsies of patients with coeliac disease and of patients with sprue syndromes due to defined disorders revealed polyclonal results in all cases (fig 1). In duodenal biopsies of 7/13 patients in the EITCL group, amplification revealed clonal rearrangements (p<0.005 compared with the non-EITCL group). Rearrangements of the tumour specimens were clonal with the same length and sequence of amplificate (table 1, fig3). Both patients with ulcerative jejunitis had a clonal rearrangement in their duodenal biopsy as well as in their whole bowel wall specimen. Two of the three patients who had refractory sprue before developing overt EITCL showed the same clonal amplificate in their duodenal biopsy as that of the subsequent tumour specimen. All patients in the EITCL group with normal CD8 positive IEL counts (>50%) had a polyclonal TCR-γ gene rearrangement in their duodenal biopsies (medians for CD8 positive IELs per 100 epithelial cells: polyclonal 68.5; monoclonal 6 (p<0.05); medians for TCR-β positive IELs: polyclonal 17; monoclonal 13.5 (p=0.22)). The exception was patient EITCL2 whose CD8 positive IELs were mainly CD56 positive and whose duodenal biopsy was monoclonal for the TCR-γ gene rearrangement. 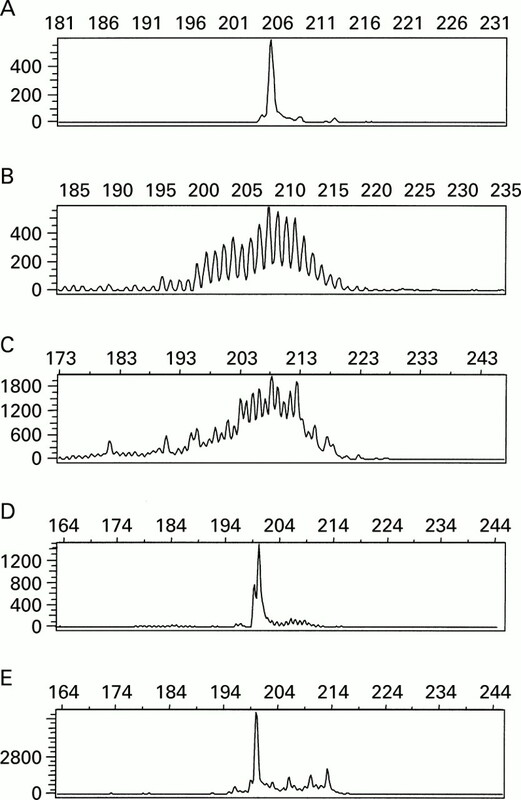 GeneScan analysis of polymerase chain reaction (PCR) products obtained by amplification of DNA from the T cell line PEER (A), of polyclonal tonsillar DNA (B), of DNA from a patient with coeliac disease showing polyclonal amplification (C), of DNA from a duodenal biopsy of patient EITCL7 with a reduced number of CD8 and T cell receptor (TCR) β positive intraepithelial T lymphocytes (IELs) on immunohistology (D), and of DNA from the lymphoma of the same patient showing the same length of monoclonal amplificate in both cases (E). Amplification of the TCR-γ gene revealed clonal rearrangement in only 1/6 patients with refractory sprue of uncertain cause. An abnormal phenotype of IELs—CD8 and TCR-β negativity—was demonstrated in the duodenal biopsy of the monoclonal case (RS6); all other cases in this group were mostly CD8 or TCR-β positive (table 1, fig 1). In general, clonality was associated with decreased expression of CD8 and TCR-β to less than 50% of IELs in 7/8 cases (fig 1). The specificity for detection of an EITCL in comparison with coeliac disease and with refractory sprue due to defined disorders was 77% with a cut off at 50% of positive IELs for CD8 and TCR-β. Sensitivity for detection of an EITCL was 85% (table 2). With a cut off at 25% of positive IELs for CD8 and TCR-β, specificity was still 89%, but sensitivity was only 31%. Immunohistology for TCR-β was more specific than for CD8 (table 2, fig 1). The specificity of TCR-γ gene clonality for detection of an EITCL in comparison with coeliac disease and refractory sprue due to defined disorders was 100% but sensitivity was only 62% (table 2). In 1998, Cellier et al in a seminal paper stated that intestinal IELs from patients with refractory sprue are clonal and display an abnormal phenotype with antigenic loss, including that of CD8 and the β-chain of the TCR.13Initially, the precise nature (reactive, neoplastic) of these T cell populations was uncertain. Evidence has now accumulated suggesting that these T cells are an early manifestation of EITCL: some of these refractory sprue patients developed overt EITCL containing the same clonal rearrangements in their overt lymphomas as in the duodenal biopsies. Furthermore, patients with EITCL may show identical clonal rearrangements throughout their intestinal mucosa as in their main tumour.14-17 As these data have an important impact on our understanding of the pathogenesis of sprue syndromes and EITCL as well as on the histopathological diagnosis of these diseases, we wished to define the frequency and specificity of these findings in a larger patient group. To test the diagnostic significance of these changes, we concentrated on duodenal biopsies. We first questioned the specificity and sensitivity of clonality and of the loss of T cell antigens in IELs of duodenal biopsies for the detection of an EITCL as data in this respect are sparse.7 15 16 Our data revealed that clonality of the TCR-γ gene was highly specific for EITCL without exception, but displayed a rather low sensitivity (54% of patients with EITCL). This low sensitivity might be due to the relatively small number of clonal intraepithelial lymphoma cells in comparison with all other infiltrating reactive lymphocytes that are also investigated in the duodenal biopsy. Dippel et al reported a detection limit of 5% of clonal DNA.24 Immunohistology had a very high sensitivity for detection of an EITCL (decreased TCR-β in IELs 100%) but was less specific. Thus decreased T cell antigen expression was also seen in 31% of patients without EITCL, in particular in patients with refractory sprue due to defined disorders. Decreased expression of CD8 (below 50% of IELs) in the absence of clonality was also found in one patient with coeliac disease who improved clinically and histologically after a gluten free diet and therefore did not suffer from refractory sprue. In view of published data, the most likely explanation for this finding is an expansion of CD8 negative and γδ positive IELs (which are TCR-β negative).7 26 Decreased T cell antigen expression in IELs of typical coeliac disease patients indicates that decreased expression of CD8 and/or TCR-β is not sufficient for a diagnosis of refractory sprue (in the sense of early EITCL), as described by Cellieret al, and that clonality analyses are clearly required for these cases.13 A combination of immunohistology and clonality investigation is recommended for the detection of EITCL. Clearly, demonstration of clonal and/or phenotypically abnormal IELs in duodenal biopsies warrants further clinical investigations as these patients may harbour or develop an overt EITCL. However, the absence of these findings does not exclude the possibility of an EITCL. Secondly, we were interested in the frequency of clonality of the TCR-γ gene and loss of T cell antigens in cases of refractory sprue of uncertain cause. We found these features among this patient group in only one case. These results appear to contrast with those presented by Cellier et al who demonstrated clonal IELs in all patients with refractory sprue.13 In our group of patients with refractory sprue however, coeliac disease was present in only one patient who had clonal IELs, whereas all patients described by Cellier et al had serological or clinical evidence of coeliac disease or dermatitis herpetiformis.13It is of interest that serological and/or clinical evidence of coeliac disease was also present in all patients in the EITCL group displaying clonal proliferations of phenotypically abnormal IELs in their duodenal biopsies except in the patient with a CD56 positive lymphoma (table1).27 These findings imply that refractory sprue associated with clonal IELs and displaying antigenic loss only occurs as a complication of coeliac disease. It is also evident that there is a large group of patients with refractory sprue who do not fit into any defined disease entity, including that of clonal IEL proliferation, and which is not related to coeliac disease. As some of these patients has neither developed clonality nor EITCL over a long observation period, they do not represent early refractory sprue developing into overt EITCL. Some of these patients may suffer from autoimmune enteropathy or some form of protein intolerance which escaped detection. Clonal populations of phenotypically abnormal IELs were found in our study in 3/8 patients with overt EITCL, in 2/3 patients with refractory sprue evolving into EITCL, and in 2/2 patients with ulcerative jejunitis. Confirming the data of Murray et al and Ashton-Key et al, identical clonal rearrangements were discovered in the overt tumours of patients with EITCL and in the mucosa at different sites in ulcerative jejunitis.17 18 Regarding the pathogenesis of EITCL, these findings imply: (1) that overt EITCL may either develop directly from coeliac disease without a precursor lesion (refractory sprue with clonal IELs) which are demonstrable in duodenal biopsies; (2) that in some patients EITCL is preceded/accompanied by a refractory sprue-like disease which is probably neoplastic from the beginning; and (3) that in these patients refractory sprue-like disease is a complication of coeliac disease. In summary, our findings concerning CD56 negative EITCL demonstrated that clonal and phenotypically abnormal IELs are an early intraepithelial form of EITCL as the same clonal rearrangements were detectable in the tumours of EITCL which subsequently developed. Furthermore, we demonstrated for the first time that patients with clonal IEL proliferations devoid of T cell antigens are clearly different from other sprue syndromes and forms of refractory sprue, and represent a distinct disease entity for which we suggest the term “sprue-like intestinal T cell lymphoma”. For diagnostic purposes in patients with refractory sprue, it appears that demonstration of TCR-γ gene clonality is highly specific and loss of T cell antigens in duodenal biopsies is highly sensitive in the diagnosis of an EITCL. These results however will have to be confirmed in a prospective study. Thus according to the results presented, a combined immunohistological and molecular genetic approach is necessary as a large number of IELs devoid of CD8 and/or the β-chain of the TCR may also occur in reactive conditions. It is also apparent from our findings that many patients with refractory sprue cannot be assigned to a specific disease category which clearly is a subject for further research. During the review process, Cellier et al reported on immunohistochemical and molecular findings of IELs in patients with refractory sprue (Lancet2000;356:203–8). Although the number of patients without features of “sprue-like intestinal T cell lymphoma” was smaller than in our study, their conclusions concerning “sprue-like intestinal T cell lymphoma” are similar to ours—that is, that this is a neoplastic disorder and a complication of coeliac disease. We are particularly indebted to Hans-Henning Müller for excellent technical assistance and Sarah Coupland for reading the manuscript. Supported by the “Deutsche Zöliakie-Gesellschaft”. The following are members of the Intestinal Non-Hodgkin Lymphoma Study Group: Dr Bettina Dederke, Medizinische Klinik I des Universitätsklinikums Benjamin Franklin, FU Berlin; Professor Dr E Dühmke, Strahlentherapeutische und Radioonkologische Abteilung, Universitätsklinikum Grosshadern, München; Professor Dr W Fischbach, II Medizinische Klinik, Aschaffenburg; Professor Dr H-K Müller-Hermelink, Institut für Pathologie der Universität Würzburg, Würzburg; Professor Dr C Ohmann, Koordinierungszentrum für Klinische Studien der Heinrich-Heine-Universität, Düsseldorf; Professor Dr A Thiede, Chirurgische Klinik der Universität Würzburg, Würzburg; Professor Dr E Thiel, Medizinische Klinik III des Universitätsklinikums Benjamin Franklin, Berlin; Professor Dr Verreet, Zentrum für Chirurgie, Krefeld; Professor Dr K Wilms, Medizinische Poliklinik der Universität Würzburg, Würzburg. (1976) Coeliac disease, gluten-free diet, and malignancy. Gut 17:612–619. (1989) Malignancy in coeliac disease—effect of a gluten free diet. Gut 30:333–338. (1994) Gastrointestinal lymphoma. Hum Pathol 25:1020–1029. (1993) Primary lymphoma of the small intestine—A clinicopathological study of 119 cases. Am J Surg Pathol 17:429–442. (1988) Enteropathy-associated T-cell lymphoma (malignant histiocytosis of the intestine) is recognized by a monoclonal antibody (HML-1) that defines a membrane molecule on human mucosal lymphocytes. Am J Pathol 132:1–5. (1988) Identification of a T-cell lymphoma category derived from intestinal-mucosa-associated T-cells. Lancet 2:1053–1054. (1989) Changes in intraepithelial lymphocyte subpopulations in coeliac disease and enteropathy associated T cell lymphoma (malignant histiocytosis of the intestine). Gut 30:339–346. (1992) Peripheral T-cell lymphomas of the intestine. Am J Pathol 141:1361–1371. (1996) Intestinal T-cell lymphoma—a reassessment of cytomorphological and phenotypic features in relation to patterns of small bowel remodelling. Virchows Arch 429:27–36. (1978) Coeliac sprue and refractory sprue. Gastroenterology 75:307–316. (1970) Collagenous sprue—an unrecognized type of malabsorption. N Engl J Med 283:1297–1301. (1998) Diagnosis of coeliac sprue. Gastroenterology 115:211–216. (1998) Abnormal intestinal intraepithelial lymphocytes in refractory sprue. Gastroenterology 114:471–481. (1998) Are complicated forms of coeliac disease cryptic T-cell lymphomas? Blood 92:3879–3886. (1999) Is complicated coeliac disease or refractory sprue an intestinal intra-epithelial cryptic T-cell lymphoma? Blood 93:3154–3155. (1999) Mucosal intraepithelial lymphocytes in enteropathy-associated T-cell lymphoma, ulcerative jejunitis, and refractory coeliac disease constitute a neoplastic population. Blood 94:260–264. (1997) Molecular analysis of T-cell clonality in ulcerative jejunitis and enteropathy-associated T-cell lymphoma. Am J Pathol 151:493–498. (1995) Study of the immunohistochemistry and T cell clonality of enteropathy-associated T cell lymphoma. Am J Pathol 146:509–519. (1997) Immunophenotyping and gene rearrangement analysis provide additional criteria to differentiate between cutaneous T-cell lymphomas and pseudo-T-cell lymphomas. Am J Pathol 150:1941–1949. (1991) IgA antiendomysial antibody test. A step forward in coeliac disease screening. Dig Dis Sci 36:752–756. (1990) Revised criteria for diagnosis of coeliac disease. Arch Dis Child 65:909–911. (2000) Refractory sprue syndrome with clonal intraepithelial lymphocytes evolving into overt enteropathy-type intestinal T-cell lymphoma: a case report. Digestion 62:60–65. (2000) Simultaneous occurrence of autoimmune enteropathy and recurrent deep venous thrombosis. J Pediatr Gastroenterol Nutr 30:324–329. (1999) Clonal T-cell receptor-gamma chain gene rearrangement by PCR-based GeneScan analysis in advanced cutaneous T-cell lymphoma. J Pathol 188:146–154. (1992) Time/dose responses of coeliac mucosae to graded oral challenges with Frazer's fraction III of gliadin. Eur J Gastroenterol Hepatol 4:667–673. (1989) Intraepithelial T cells of the TcR gamma/delta+ Cd8- and V delta 1/J delta 1+ phenotypes are increased in coeliac disease. Scand J Immunol 30:665–672. (1998) Most CD56+ intestinal lymphomas are CD8+CD5- T-cell lymphomas of monomorphic small to medium size histology. Am J Pathol 153:1483–1490. * Members of the Intestinal Non-Hodgkin Lymphoma Study Group are listed in the .